Using specialist software KGAL has been successfully undertaking hydraulic simulation for several years as part of our expanding portfolio of services. Simulation enables a hydraulic system’s performance to be evaluated for a wide range of loading and ambient conditions before the machinery is built. The system enables the accurate application of mechanisms and loads including inertia, gravity, external forces, wind loading (steady state and gusting), snow loading, flow rates, pressure changes, actuators, buffers, etc. In addition, the electrical control system can be simulated so that the sequencing and responses of the system can be fully integrated. It has become commonplace to undertake such works on moving bridges and now the technology has been successfully applied to water control structures. Recent flood defence structures that we’ve simulated include the Benfleet Barrier, the Dartford Creek Barrier and the rising sector gates at Nakdong and on the Han River in Korea. You can see a short video of the Dalseong weir at Nakdong here. Simulation can find out potential areas of control instability and cavitation; our systems let us model the effects of flow variation - even rate changes caused by leakages and friction. 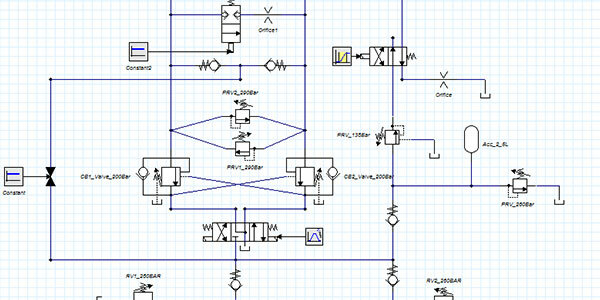 With some component lead times being as long as 26 weeks, it is usually far more cost-effective to avoid problems on the drawing board than solve them on site; computer-based simulation is the cost saving solution. What’s more, there are significant safety improvements as the system can be shown to operate within its safe operating limits under all conditions, including overload. Wherever safety is paramount, hydraulic simulation can verify the effectiveness of different concepts and provide additional assurance. The rapid-build nature of the hydraulic simulation system enables alternative solutions to problems to modelled so that clients have a comprehensive 360° view of the options. 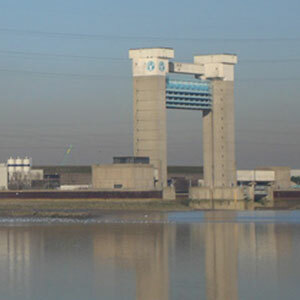 The image shows the Dartford Creek Flood Barrier in Kent, England. The existing hydraulic drive system (lifting two 160 ton vertical lift wheel gates) is to be replaced by a direct drive hydraulic motor for which we are undertaking the modelling and simualtion.